Earlier today, we spent some time with Bastion, an Overwatch character who is literally a transforming tank. 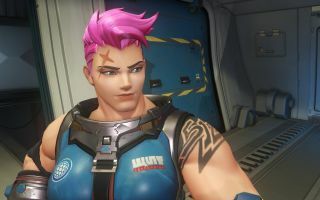 Now it's time to look at a different kind of tank: Zarya, a muscular, pink-haired Russian who carries a gun the size of a Volkswagen. Zarya looks (and sounds) quite a bit like the Heavy from Team Fortress 2, but as we noted in our PAX hands-on in March, her playstyle is quite a bit different. She appears considerably more mobile in combat, and her Particle Cannon is more defensive in nature: Rather than laying down sustained heavy fire, it projects either a short-range particle beam or an energy grenade. It can also emit an energy barrier that shields either Zarya or a teammate from enemy fire, boosting the cannon's power in the process. Her ultimate is a gravity bomb that pulls in enemies and deals damage while they're trapped. The Overwatch beta is expected to begin later this year. Put your name in the hat at Battle.net.